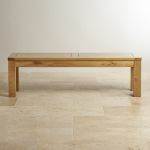 This classic solid oak 4ft 11" bench offers spacious seating within a clean-cut, contemporary design. Made using the highest quality solid oak timbers, it's designed to complement any of our suitably-sized solid oak dining tables. 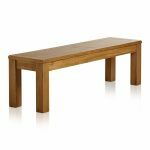 Characterised by a chunky frame with beautifully inlaid grooves it's finished with a simple coating of light wax furniture polish. Designed to nourish and protect the oak, this specially formulated wax is best reapplied every three to four months for a long-lasting lustre. 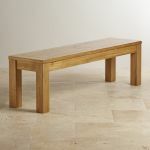 We never skimp on materials at Oak Furniture Land which means no veneers, no MDF and no chipboard. 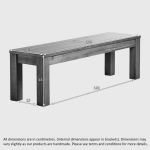 Take a look at our huge selection of quality solid oak dining tables to discover how simple it is to revamp your dining room.